A 150 million-year-old two-headed reptile fossil has been discovered in north-eastern China. 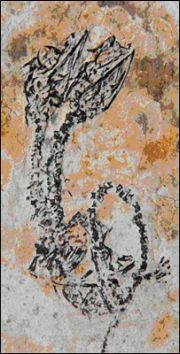 The fossil has been dug-up from the Yixian Formation. Previously, remains of early birds and feathered dinosaurs were also discovered from the region. Only seven centimetres long, the tiny skeleton from the early cretaceous period is an embryonic or newborn reptile possessing two heads and two necks. The two-headed reptile has a long neck and used to live in water when the dinosaurs romped the earth. When fully grown, they were sized about a meter! This reptile species’ two-headedness was a growth-flaw, called ‘axial bifurcation’ which is well-known today among turtles and snakes. Britain’s defacto academy of sciences, The Royal Society will be reporting this finding in Biology Letters. ← Seafood catches drop: This Christmas may go without seafood delicacies!